Don’t go on a rainy day if you can help it, and DON”T stay in Georgetown. Linger near the bigger populations centers if you are a tourist, as you don’t have the luxury of a fixing a meal in your own kitchen. I think of PEI as sort of one of those places where you’d rent a cottage on the shore, pack up an extra suitcase full of books, and lay around recovering from the rat race. I also think we were more worried about lodging than we needed to be. 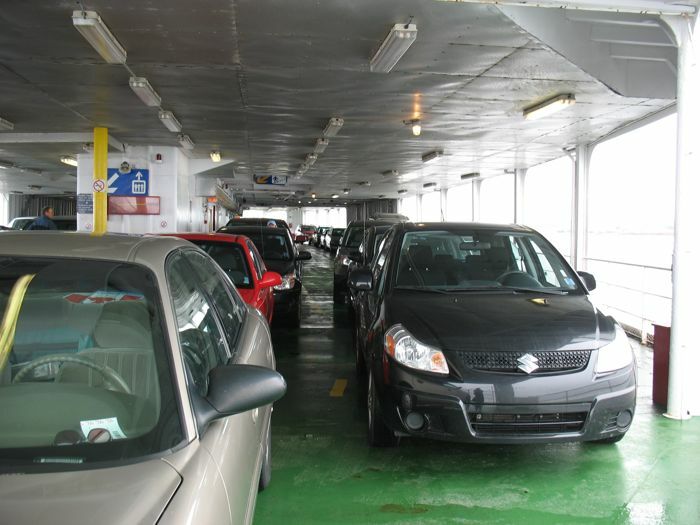 If you have a car, hit the Tourist Office and let them help you book a place. Risky, but maybe less risky than what we did. Although it doesn’t look like a big place, the travel on the roads is slower, so leave yourself enough time to get places. I also enjoyed the ferry ride, but if the bridge drive had been on a sunny day, I may have enjoyed that too. Favorite place, hands down: Cape Breton. Why? Certainly our bed and breakfast in Mabou had something to do with it, but I also like the idea that there’s this sense of pride in craftmanship and music and that you can find both, easily. Make sure you hit a ceilidh (“kay-lee”), which in the loosest sense is just a community gathering. Ours was on a Tuesday, and was a little more formal. I wanted something a little more random, a little wilder, but we were too early in the season, I think. Cabot Trail is lovely, but sparsely populated. You can find eats and drink on the way–but as usual the prices are a bit high. We stopped at a grocery store and picked up bread and ham and a package of oat shortbread cookies that we munched on all week. Try to have some flexibility to time your drive to the weather–hard to do, I know. I think that’s why it’s so popular with RV-ers, who seem to be more flexible. 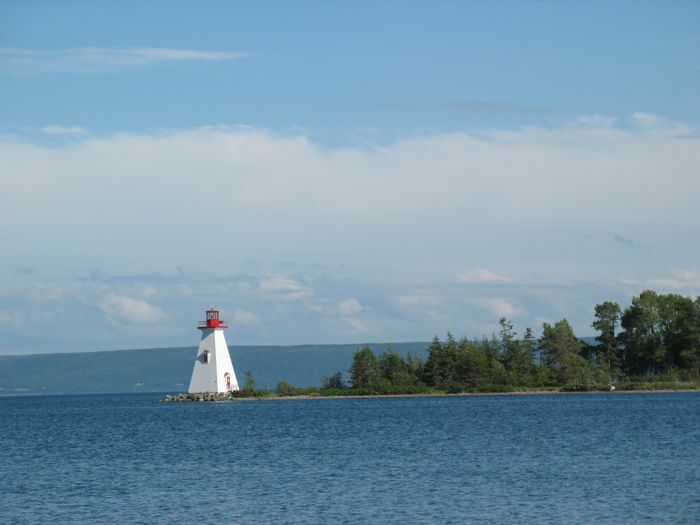 Baddeck is a good base because you could go either forwards or backwards around the trail. Consult the web for people’s preferences. We went eastward, and it was fine (clockwise). 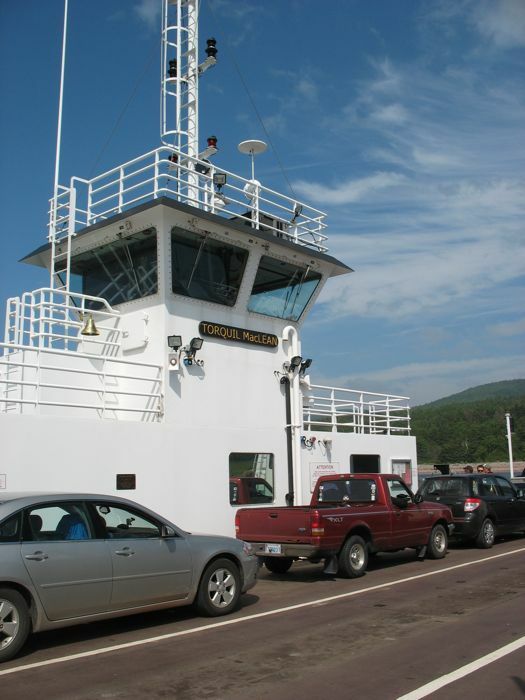 There’s basically only one way in and one way out of Cape Breton Island, and the average time from Baddeck to Halifax airport is about 3 and 1/2 hours. Skip Prospect, in spite of what the Lonely Planet guidebook tells you. 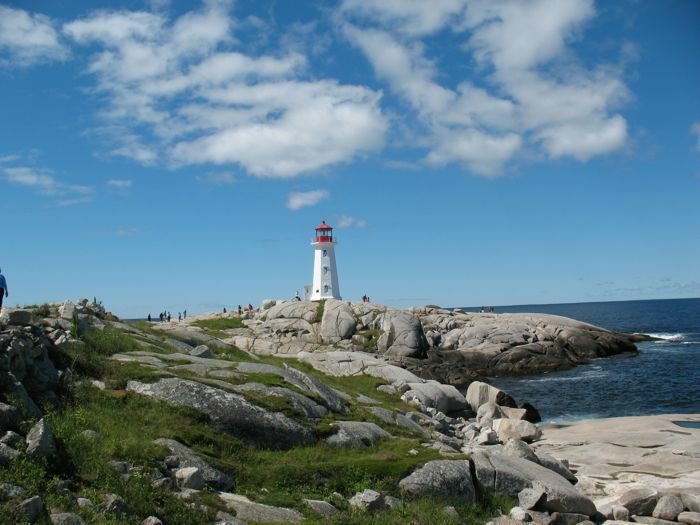 Avoid going to Peggy’s Cove on a day when there is going to be a cruise ship in town (check with the harbor-front Tourist Office–they seemed to know and were VERY helpful in so many ways). It’s a small place. Do your homework, because even if the Tourist Office is very helpful, you don’t always know what questions to ask. I found out only later, when we were home, about the large memorial to the victims of the Halifax Explosion. I would have liked to have seen it. The movie we watched to get a sense of it is available on Netflix: “Shattered City: The Halifax Explosion.” I recommend it. If you are not a gift shop enthusiast, be aware that this is one of the main things to do in both Mahone Bay and Lunenburg. They have a good network of art galleries in Lunenburg that you can visit, but also keep in mind that you are not in New York or San Francisco. The quality of the gallery art will vary, but I do think it is a good way to get into the local scene. Approach Halifax like you would explorations in a big city: break it down by neighborhoods and enjoy those. Take some time in the Public Gardens. I wish we’d gone to the Citadel as well, but didn’t leave time for it. To get from the airport to your hotel, buy a pass at the Tourist Office in the airport, or if they are closed, head to the Change place (that’s what we did). The ride from the airport on a 747 Express Bus is quick, runs 24-7 and costs as much as a one-day pass that’s good on all the Metros and busses, so we bought that. We actually bought a three-day pass for $14 dollars, then another one-day pass ($7) for our last day. We ended up giving our passes to a couple of tourists who were trying to head to Montreal for the day. There’s a very good map that when opened has been folded so that only certain sections of the city are visible–and it’s labeled really well on the edges–kind of like tabs. It’s called “Official Tourist Map” and worth trying to get (we snagged ours at the airport). We also made a lot of use of Frommer’s Montreal Day by Day (ISBN 9780470507346) as it was small, tote-able and well-organized with a good metro map and a good map of the main area of Montreal. This is a Big City. Harder to access than would be a European city, but I must admit finding good food helped a lot. The Old Town has its charms, but it does not remind me of a European city (sorry). If the weather permits, walk around. We found more things that way that we enjoyed (eg: Suite 88 chocolate shop). If the weather doesn’t permit, head to the Underground. We didn’t leave very much time for that, and it is a city all by itself. Leave time for a tour of the Chapelle Notre Dame de Bonsecours and their museum, heading to the top of the tower for good views of the St. Lawrence river. Premiere Moisson saw us twice this day: first up for breakfast. This man was slicing the tops of all his bread with a razor, just before sliding them into the oven. He was really quick with that blade. We took it all back to the room and looking out at our view, enjoyed our meal at our own little sky-cafe. I was determined to shop, or at the very least, look. So we walked over to Roots (a clothing shop). I couldn’t fathom paying some of these prices, and besides I’d spent the morning packing, which included getting the wooden box we’d bought yesterday in the bottom of my suitcase, much to my husband’s amazement and delight. So, I walked down into the underground mall and found Dave there, snapping away with his camera. These are vast spaces, that I’m sure are hooked into the office towers we see all around us downtown. Flying sculptures fill some of the space, as well as a runway, for fashion shows (Dave figured it out). Looking up into one of the open space towers. I think the whole place was on sale. Clever punning here. We made one more stop to Premeire Moisson for our airplane meal, then grabbed our suitcases and checked out. Our bus stop for the 747 Express Bus was right across from the Maria Queen of the World cathedral. These statues on top represent the patron saints of all the parishes that constituted the Montreal diocese in 1890, when it was completed. I like to think of them as bidding us farewell. This deserves its own post for one reason: Première Moisson Bakery. Première Moisson means “First Harvest,” which I assume refers to the wheat in their flour, or possibly the fact that everything is so fresh looking in the morning. I’d read about it before coming to Montreal and was delighted to find out how close one of their shops was: about a five minute walk and then down into the underground Main Train Station. You’ve already seen some of this place in the post on Montreal. I went along the entire case that morning, snapping photos, like any dumb and besotted tourist in love. So here’s selection of what I saw that morning. 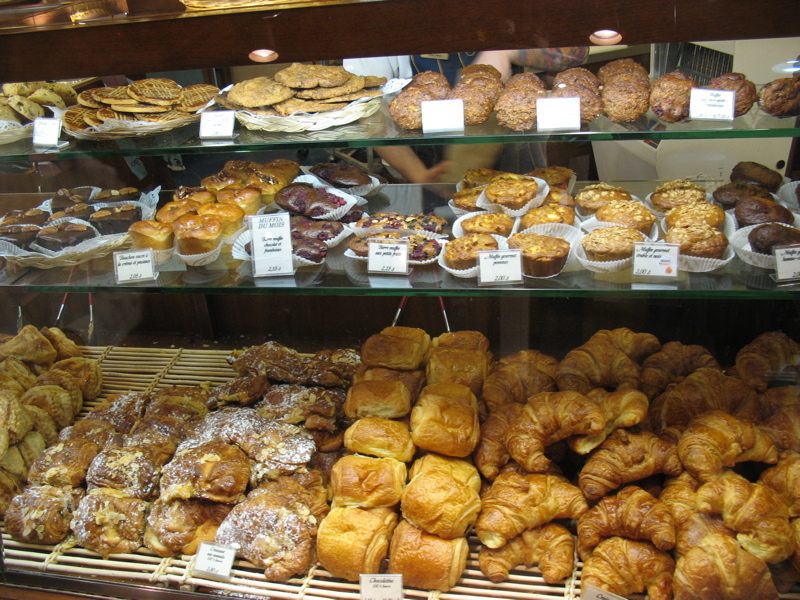 Three shelves of pastries, with duplications. Baked goods. The special for the first day was a Apricot-Almond-Coconut loaf. We didn’t get that one, but we did buy the next day’s special of Raspberry Bread. It was like a large folded over half-circle, with a layer of fresh raspberries inserted in the folded-over space before baking. The result (which we bought and took with us on the airplane and ate mid-flight) was like a slightly tart raspberry jam inside of a lightly sweetened soft dough. It was divine. They actually have a book on baking, but it’s all in French and Metric measurements–a little difficult for us American bakers. Cakes. Dave was temped to try and figure out how to take one of these on the plane. This was the next section over and some had shiny chocolate ganache as a frosting. This is the sandwich section. We bought the pear-cheese on hazelnut-golden raisin bread and the roast beef on an herbed roll for our “airplane food” on Wednesday morning. I don’t see them here. This was a close-up of the lentil salad from their salads section (we took a small container for our travel lunch). You’ve seen this case already but it’s worth a second look. Première Moisson has figured out how to do what I wish the French would have done: combine an almond croissant with a pain du chocolat. I had a chocolate-almond croissant both mornings; it was heavenly. We ate this little treat right after our lunch of Vietnamese Spring Rolls which we’d picked up in the underground. Backing up, this was Dave’s Croque Monsieur (grilled cheese and ham sandwich) that he had at L’Express on Sunday. The french fries had such a unique and wonderful flavor that the waiter offered to find out for me which kind of potatoes were used. He came back with the answer “The Chef says it’s a secret.” I do know that Canadians pride themselves on their new potatoes that were appearing in all the stores and on menus, but this didn’t remind me of a new potato. The little sauce was fresh mayonaise. Dave said when he was in France it took some getting used to, but now if feels normal (although he still uses catsup when we’re at home). A little luncheon quiche, with green salad. That night we went to L’Academie (check map on Canada page for restaurant info) and we both had the same thing (it was a special): gazpacho, which was very good–cool and a bit piquante. Then nothing-to-write-home-about ziti in sauce. Monday’s lunch was at Cafe des Arts in the Marche Bonsecours. Grilled panini, two drinks, a cool place to sit for a while and a most unusual biscotti that was studded with nuts and chocolate chips. We bought another for the road. We dined that night in Old Town, where we nabbed (by 10 minutes) the early-bird dinner. This was Modavie and that table is not set because they had a jazz singer and guitarist in for entertainment. As we were eating we saw a group of six older customers come in and sit at the bar. They enthusiastically applauded the duo and after a couple of drinks, they left, but not without one woman coming up and kissing the singer. Her grandmother? Sometimes you can tell a lot about a place by their breadbasket. These all tasted like store-bought breads. The long roll was especially grocery-store like. Mine was a raspberry sauce over salmon. That’s a bottled raspberry sauce dripped on top of over-cooked salmon. Dave’s was chicken something-or-other, which even he didn’t finish. The potatoes and vegetables were good, though. But on the other hand, I can’t say enough good things about Olive et Gourmando, an extrememly busy, but efficient place in Old Town. This was our salad–so refreshing on a day where the weather was about 104 degrees in feeling, when the temperature and humidity were combined (in their “humidex”). I’ve posted the recipe over on Elizabeth Cooks. We also had this panini, and I’m pretty sure it was The Cubain: ham, braised pork, homemade mayonnaise (chipotle peppers, pickles, lime, and coriander), with gruyère cheese. I didn’t write it down, but took it from their website later on. On Sunday, we passed by this young man handing out pizza samples–they looked great. Notice the heart-shaped trash can below. This is the famous St. Viatueur bagel shop. Fresh bagels are in a mound to the right of the wood-burning oven. Watching the fellow in black was poetry in motion. (I should have watched the man in white shape the bagels.) After they were shaped, he threw them in a “honeyed water” (from Frommer’s guidebook) and the fellow in black scooped them out with a strainer and coated both sides with sesame seeds. He lined them up on the long narrow boards, then put them on the left side of the oven (below). When they were done to some degree of doneness, he took the spare board, scooted the bagels all to the right, then flipped those on the board onto the floor of the oven in one deft move. And those on the very far right, were removed by sliding that thinner, spare board underneath them, then flipping them out into the sloping channel, where they’d tumble down into the mound. The nearby fellow would bag them up. We shared one. It was really good. I forgot to take a photo of Suite 88, the chocolate shop we went to in Mont Royal, but this one from their website will do. I liked their chocolate bars (favorite was the”Gingembre”–ginger in dark chocolate, and “Cinq Epices” with had five different spices in the milk chocolate). A fitting end to eating in Montreal. This is in two parts–Nova Scotia and Montreal. We learned quickly to dial down our aspirations for food in Nova Scotia, with occasional exceptions. 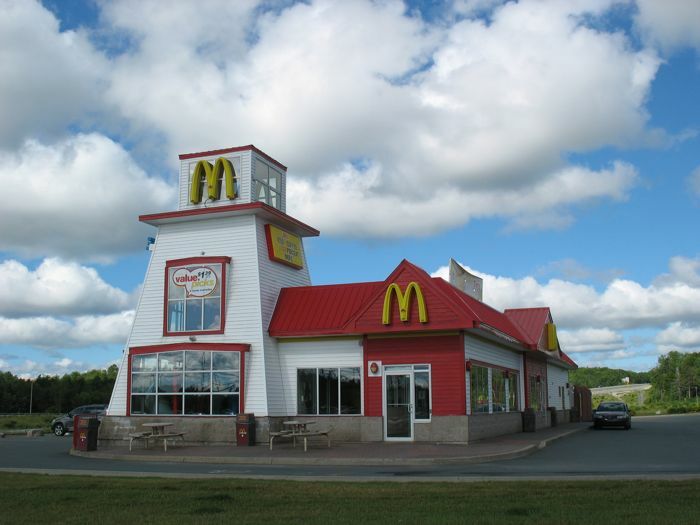 Sorry to let you in a big secret, but in a land where Tim Hortons is as big as McDonald’s in the States, you can also expect some of the same mediocre food as you would find in the States. This is frustrating for travellers, but we soon learned to adapt–full was the only criteria in some places–not flavorful or wonderful. We weren’t in France or Italy, after all. In order to spare you the agony of another Tim Hortons sandwich (which really isn’t bad, if you get used to it), not all of our meals are here. First breakfast at our B&B in Truro: cheesy turnover, a slice of Canadian bacon, scrambled eggs and three halves of grape tomatoes. It was all set on lovely china, and they had really good hot chocolate for me. Dave and I didn’t end up sitting next to each other because of the way the first two couples sat at the table–I had the better meal partners (they were from England, and funny). Our restaurant in Georgetown, Prince Edward Island: Clam Diggers. Charming design, with peeling paint as an accent. The only reason why I show these two meals is to give you an idea of the adjustment we were trying to make, racheting down the expectation level. Later, when I mentioned to the American innkeeper at Glendyer Inn that we’d had a wrap, she slowly shook her head. “They don’t do wraps here very well,” she said. No, they don’t. Notice that the wrap is grilled/toasted. Things picked up in Mabou at the Red Shoe Pub, although the texture of the hummus was not typical. This was the starter to a fine meal, where I had the linguini with lobster and asparagus, but the photos didn’t turn out very well. We saw these in a grocery store in Truro–they give a thermometer to approximate the temperature of the peppers inside. I could use that kind of help at the grocery store. At the Bell Buoy Restaurant in Baddeck, we each had lobster, and it was great fun as well as fresh and flavorful. The first night we were in Halifax, we ate here, at The Carleton, in the oldest building in downtown Halifax. We both had linguini with seafood and it was very good. It was served with (what else?) toasted bread. The second night was Subway in the Halifax Performing Arts Center (we were running late so had to eat stadium food), but the last night we came to FID. With the delivery of the bread basket, we knew we were in new territory, insofar as Nova Scotian food was concerned. All on a little tiny plate. Even Dave’s knife was beautiful. We both had smiles on our faces. Dessert was sticky toffee pudding. The toffee was the sauce, the pudding was the super-moist cake. That’s the end of Nova Scotia. The little black car to the right was our main mode of transit around Canada, and we logged some 1202 miles driving around Nova Scotia, Cape Breton Island and Prince Edward Island (thats 1934.4 kilometers, which sounds like a whole lot more than the miles equivalent). 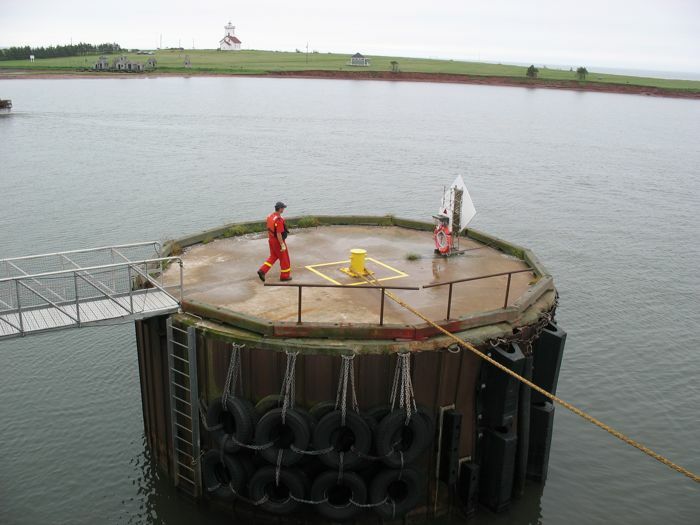 Here it’s parked on the car/people ferry from Prince Edward Island to Nova Scotia, heading across the Northumberland Strait. Like good little passengers, we hung around for a few minutes, but then went upstairs to the Feeding Frenzy Lounge, where it smelled like scrambled eggs and bacon. I guess all the Asian tourists were hungry; there wasn’t a seat available inside. So we headed outside into the wind and cold. 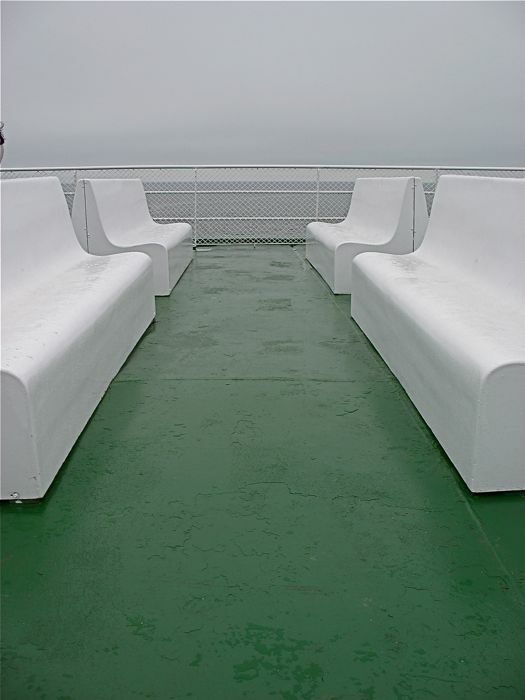 Because it was a rainy day, and the usual scenery was obscured by fog and damp, I tried to see the ferry in terms of shape and color, instead of looking for the usual tourist views. What follows is a few of our shots on that gray day. I wore this coat three times. Here’s one. The other two were schlepping around Green Gables, and watching fireworks in Halifax on Canada Day. 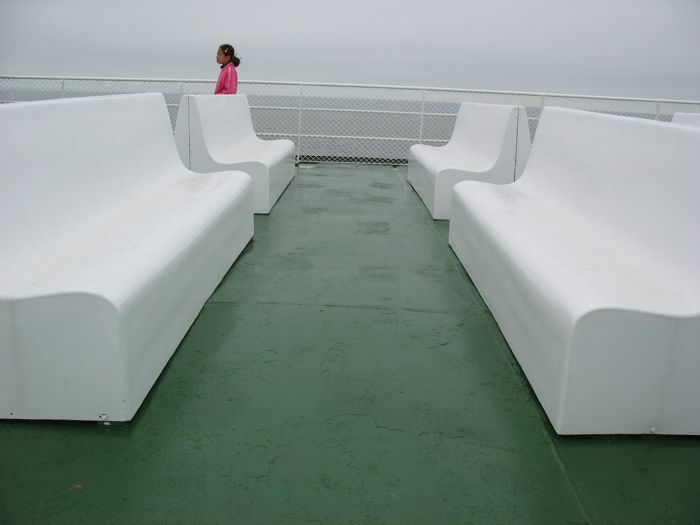 The name of our ferry was the Charlottetown, even though it sailed from Wood Islands. 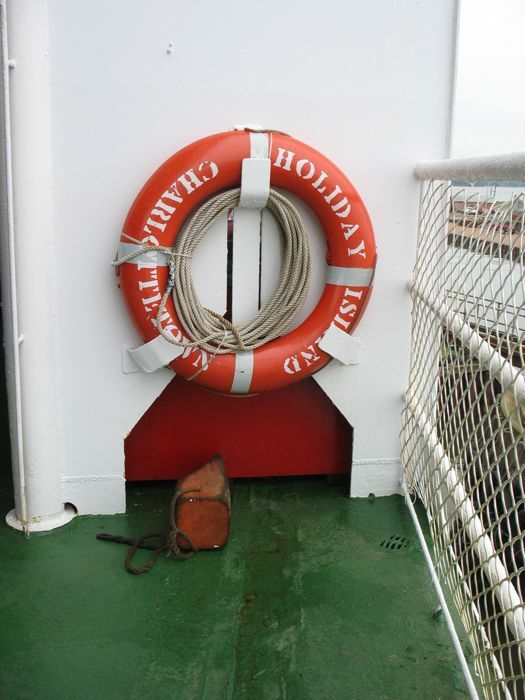 The rope mooring the ship to the dock is about to be cast off, which made me wonder how in heavens name did they get the rope out to that peg in the first place? You could lose sleep over these little questions of life. 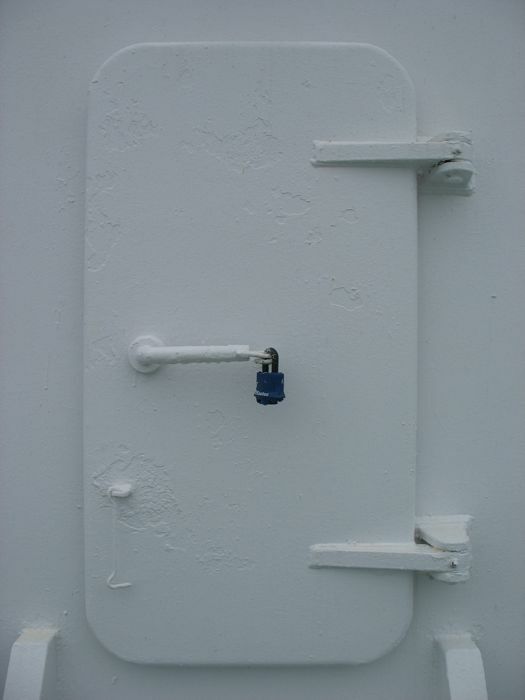 The bolts have an almost sculptural quality to them, smothered as they are in white paint. Any color pops out on this white ship. 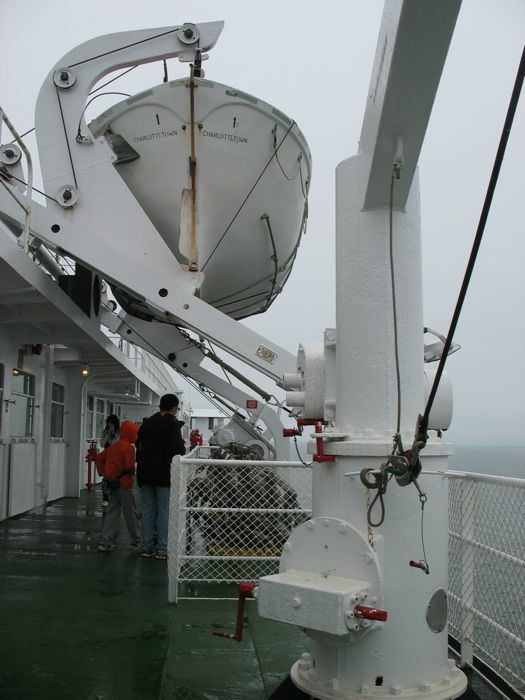 Like this orangey-red deck atop the navigation module. We went up on observation deck, where the wind was whipping around at a good clip. 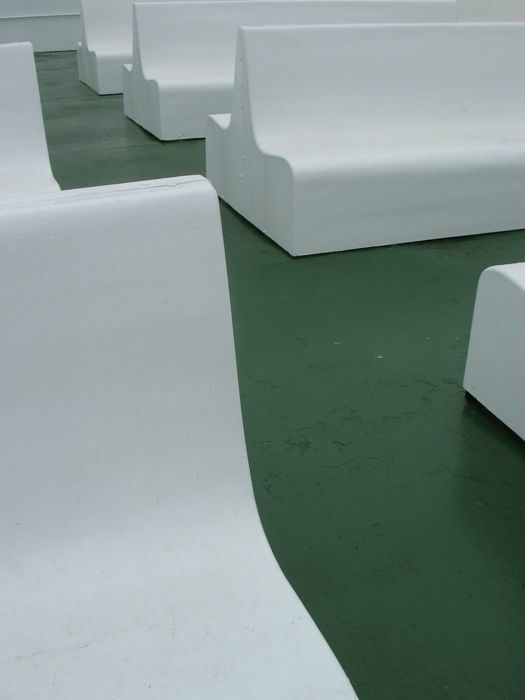 These modular benches appeared somewhat two-dimensional, flattened in the low light. The girl in pink backed into the shot, and I liked that spark of color. As you can see, we had the place mostly to ourselves. 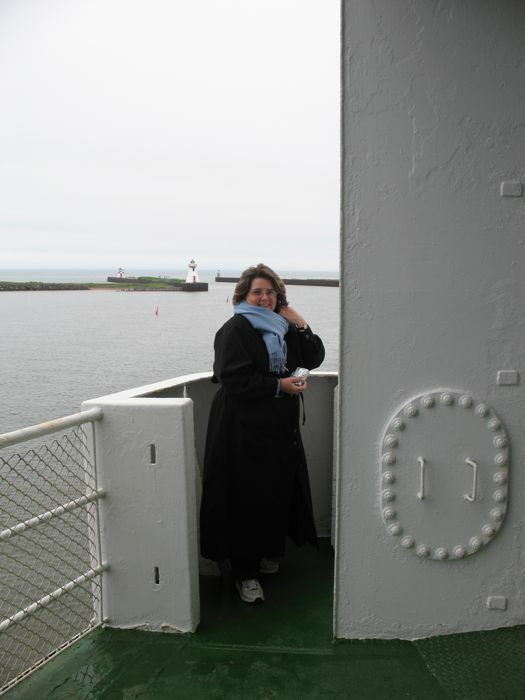 But the wind became too cold, so we went back down to the Lounge, and then snuck down to the car deck, where we climbed in and let the boat rock us to sleep. We awoke when we heard the voice over the loudspeaker tell us to return to our cars. 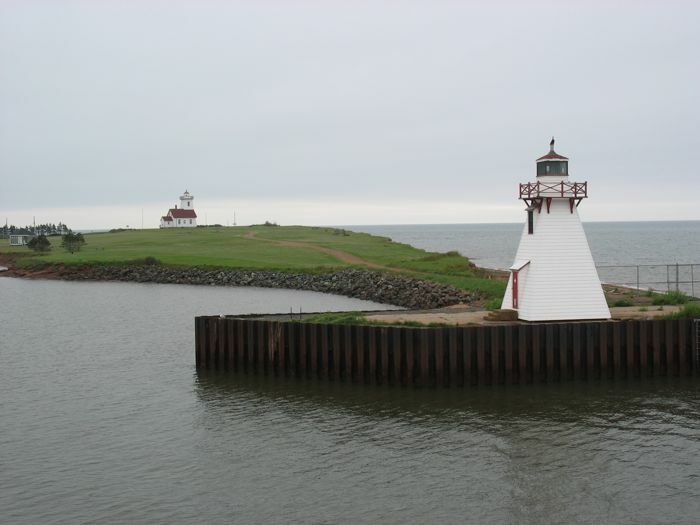 Land is sighted: Pictou Harbor on Nova Scotia. Another day we took the rope-drawn ferry across St. Anne’s Bay. 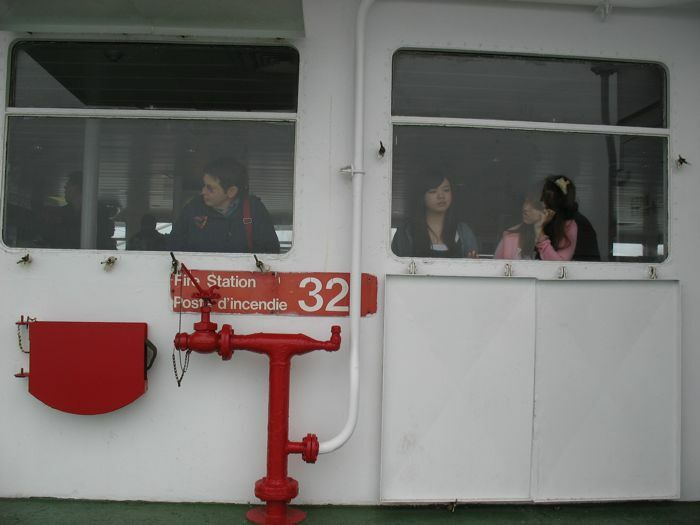 There was about a 5 minute wait, then the ferry showed up, off-loaded, loaded and we had about a five minute ride across. ﻿The Torquil MacLean holds 15 passenger cars but can handle larger vehicles (including semi-trailer) as well. 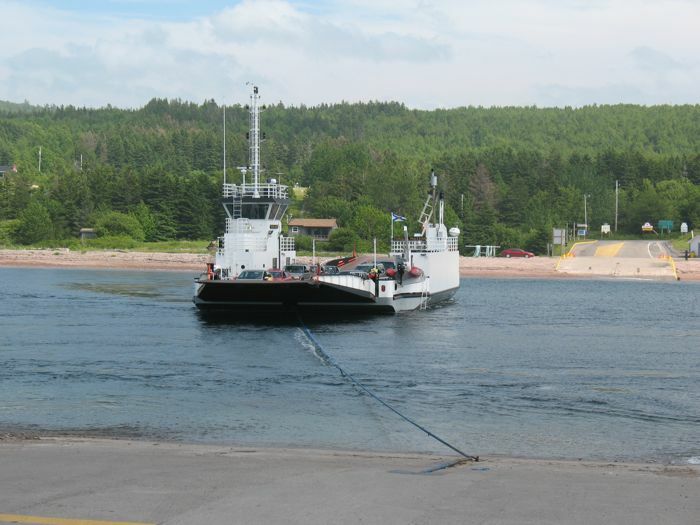 It operates 24 hours a day and is the busiest of the 7 inland ferries operated by the province of Nova Scotia, handling an average of 600 vehicles a day. The Torquil MacLean is named after the man who ran the first ferry (a row boat) at this location in about 1871. 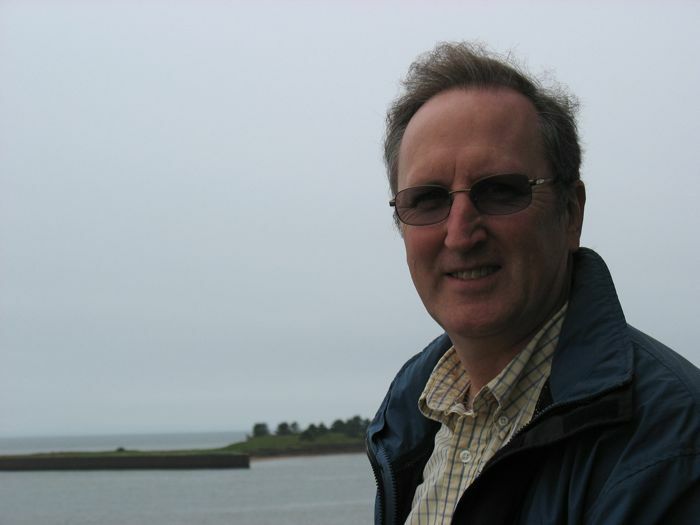 Of course the other types of transport were jet airplanes, but that’s nothing unusual in this day and age, and you can imagine them yourself, although none probably have the name like Torquil MacLean. We soon figured out that the shape of a squared-off building tapering to a cupola (and a place for the light) were a popular theme. 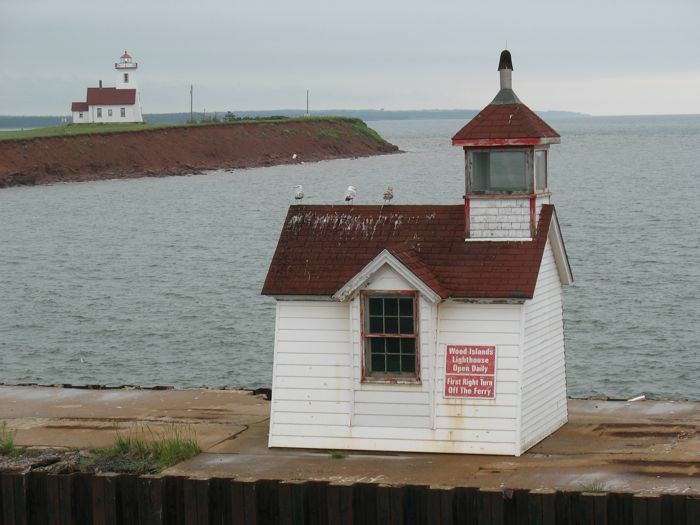 This next one was spotted from our ferry across the Northumberland Strait–which one is the real lighthouse? The closest building sat on the breakfront, which we glided past as we sailed. We think the one in the background is the real one, because we glimpsed a flashing light. All the lighthouses used to be manned, but slowly they were automated. 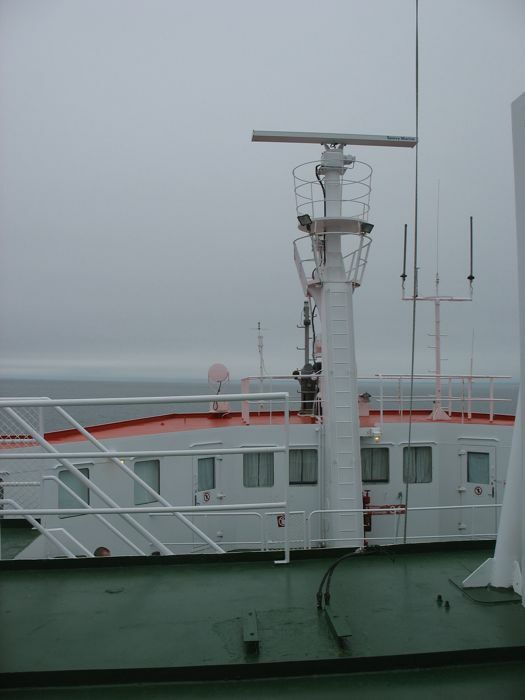 One fiddler we met got his start working in a lighthouse, as his first job demanded 11 months of isolation, before the crew was moved to a 28-day rotation. We met him when we stopped on the east side of Cape Breton, coming down the Cabot Trail; we didn’t buy his CD of fiddle tunes, instead buying another where we could hear the stomping feet in the background (his recommendation). He was quite garrulous–obviously making up for lost time. Click on the picture to be taken to his website. A third little building right as we’re leaving Wood Islands, PEI; I still think the real McCoy is in the background. Click to enlarge and you can see the light. 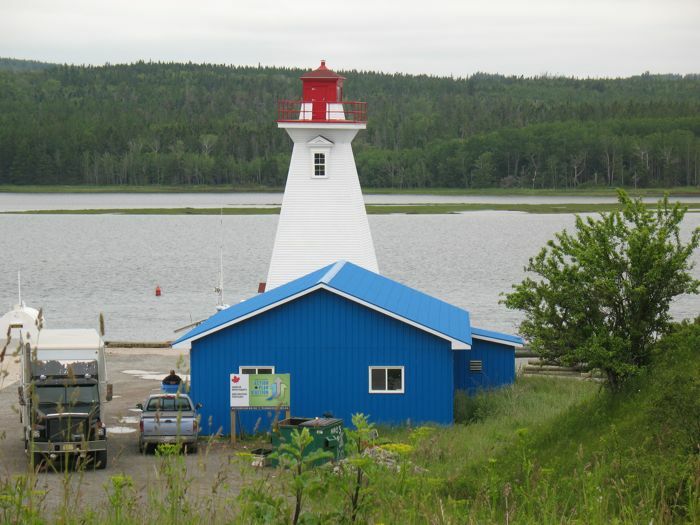 I went onto the Canadian Coast Guard page and these three are known as the harbour and breakwater “lights.” That’s what they call them–not lighthouses. 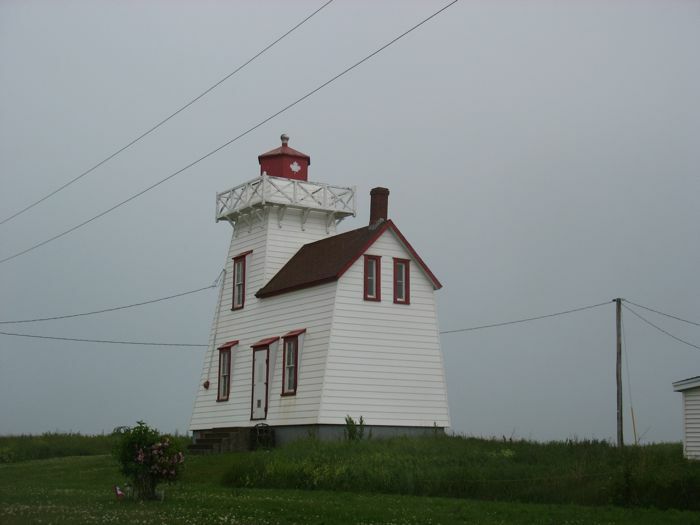 Pictou, Nova Scotia has a lighthouse on their pier, but again, it’s just a building shaped like a lighthouse for all I know. Inside they had a map with lights for all the lighthouses in Nova Scotia, with the red, yellow and white lights blinking off and on, supposedly corresponding to the actual lighthouse. This one was like a mini-museum, with lighthouse trinkets for sale. 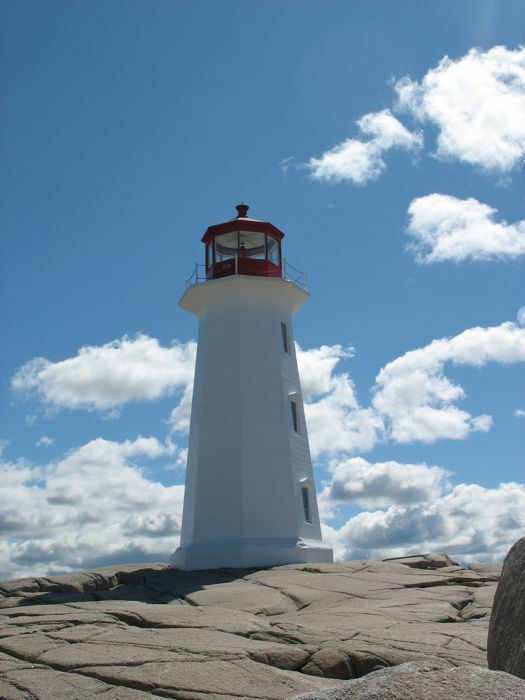 The website that lists all of these is the Nova Scotia Lighthouse Preservation Society. Good way to waste some time looking at their interactive maps. 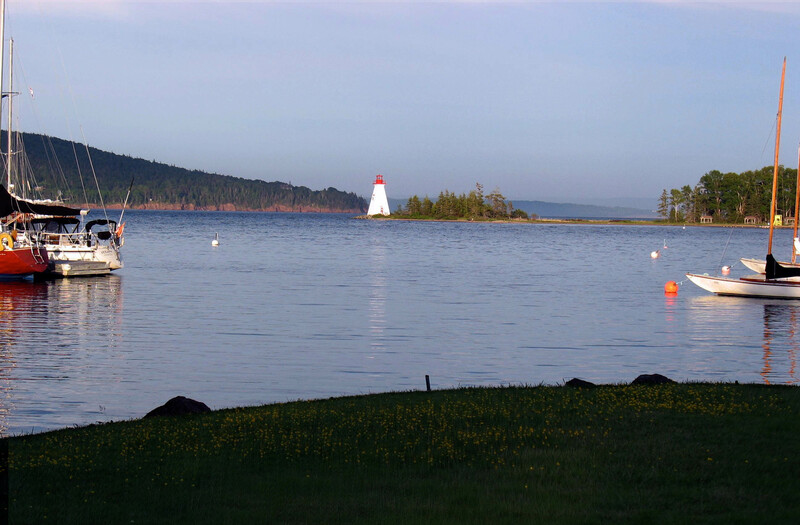 On the east side of Cape Breton is a huge salt water lake, still connected to the sea, called Bras d’Or. 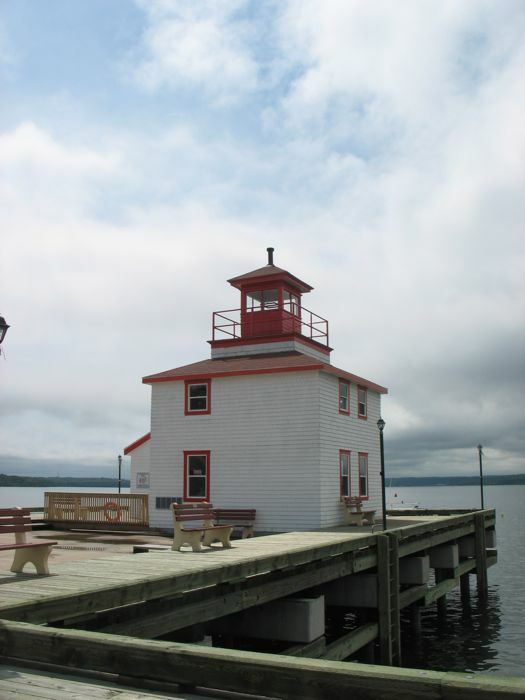 This lighthouse, at Baddeck, sits on the point of Kidston Island. The lighthouse in the evening, after our lobster supper. I picked a buttercup flower from the grass and held it under Dave’s chin: yes, he likes butter. When we were children, we morphed that old wives’ tale into “if you see yellow, that person’s in love.” I like that one better. The next up close and personal was near Halifax, on our way to the famous Peggy’s Cove lighthouse. Obviously McDonalds is trying to fit into the territory with this design. Peggy’s Cove is really as beautiful as everyone says it is, and windy, too (see post for that day for tourists with windswept hair). We parked our car at the visitor center and walked in toward the lighthouse. This is taken from the sea-side of the lighthouse, looking back toward the land. The rocks are massive, and so right for playing. I wish we had the grandchildren with us, as we remembered the fun they had in Pacific Grove, clambering all over the rocks. The heroic shot, one of many that we took that morning. 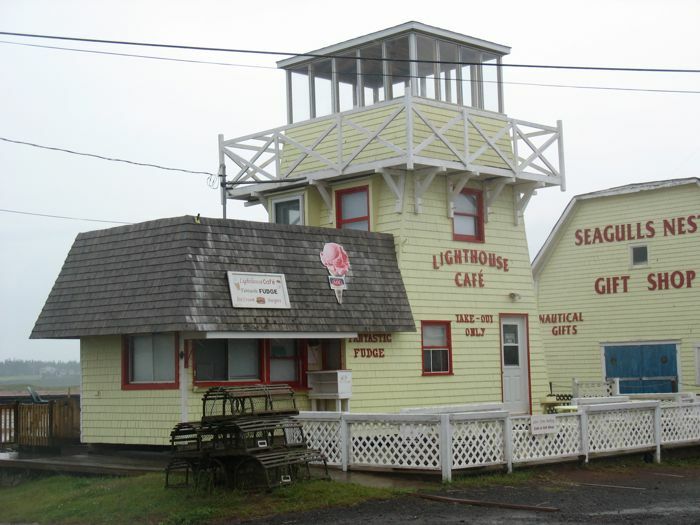 The only lighthouse souvenir I purchased was a small wooden model, for sale in the restaurant in Baddeck. It now sits on my kitchen windowsill, lighting my way to the dishes. I’d been reading the guidebooks, the web, and had found several food items that seemed to be Montreal specialties, and since this was our last full day, we had to hit them all. But first, a stop at the cathedral that we see from our hotel window. This is the cathedral seen from our hotel window, with a spectacular name. It was made in the image of the Vatican’s St. Peter, at 1/4 scale, apparently, and it is deja vu when you enter, complete with the baldacchino in the center. Next stop: Première Moisson (which means First Harvest), a bakery that I’d read about. Luckily there was one just kitty-corner from our hotel, deep in the underground underneath the Fairmont Queen Elizabeth Hotel (or Main Train Station). I think just viewing this counter, with all its fresh baked goods, revived our flagging tourist spirits. It was amazing. We each picked two things and shared them. Look for more pictures on Menu–Montreal. Just around the other side of this massive U-shaped counter, with pastries, baked goods, sandwiches, tarts, cakes, desserts, salads and other amazing things, was an area with tables and chairs. I loved the murals on the walls. Revived, we took the subway over to Marche Atwater to see what this indoor market looked like. In front were the city bicycles for rent–we saw several of these Rent-A-Bike stands. We just looked, but I had fun looking. Of course, since today is supposed to be hotter than yesterday, we concentrate on going where the heat isn’t–but it isn’t working. The heat is everywhere. 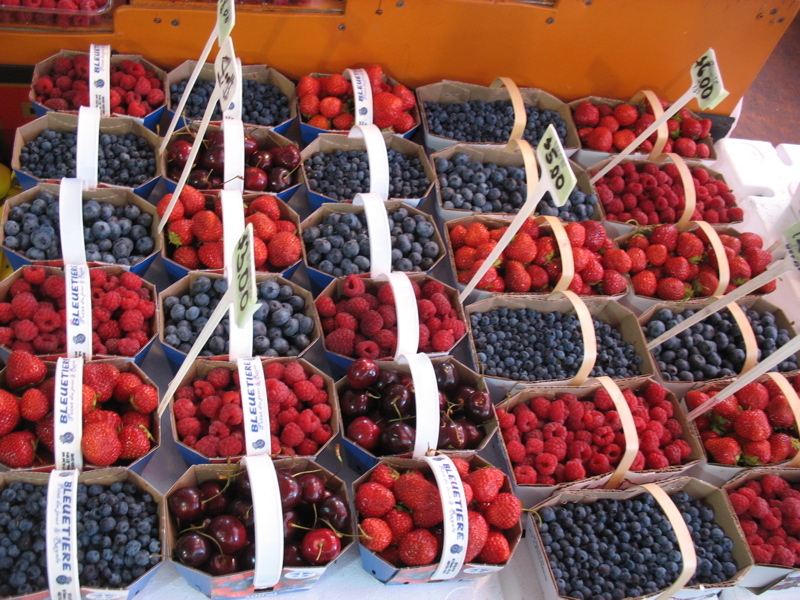 Well, this place wasn’t Lyon with its amazing street market, but we did see some interesting produce. And flowers. Now I know they just BUY those rounded baskets, instead of painstakingly clip them into shape. We headed back down to Old Montreal to go to this little church, Notre Dame de Bon Secours, where the theme is on sailors. 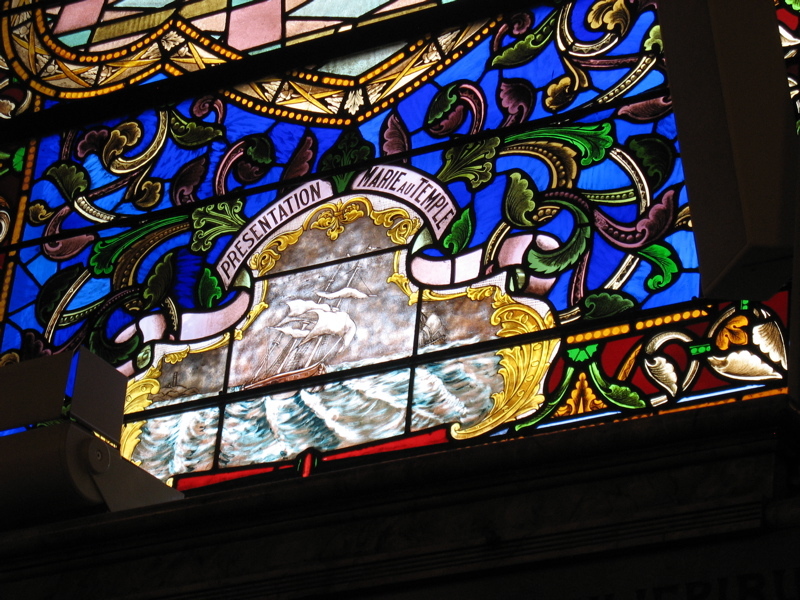 Ships in the stained glass and small wooden ships hanging from the beams (complete with two green votive lights) remind us of the impact of the sea on the early economy and on the lives of the early citizens of Montreal. 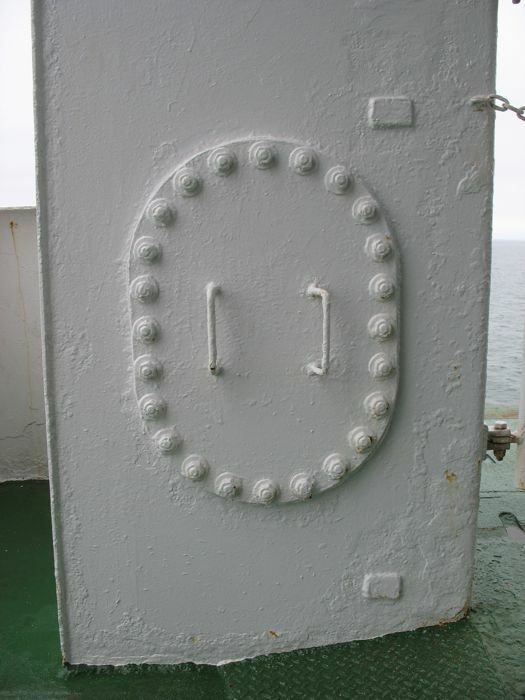 Detail of ship. They have all kinds of these suspended from the ceiling: cargo ship, schooners, and several others I don’t know the names of. This chapel was originally built in 1655, then re-erected after a fire in 1771. Looking from the backside, the dome is the one with the figure on the top. As usual, back home, I’m having a “should-have” moment, when I discovered that there is a tour to the top of the tower at the back. Add it to The List. We walk alongside these buildings, with a view of Marche Bonsecour in the background, heading to see the St. Lawrence river. 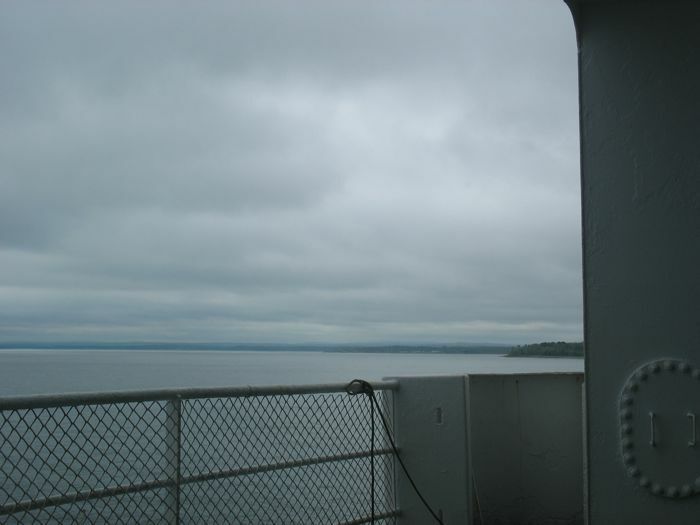 I can see why they call it the St. Lawrence seaway. It’s huge, and while the section nearest us (where the little boat is) is fairly calm, the rougher water is moving very quickly. We watched one boat tried to come across this section, engines full throttle just to stay in place until it could reach our side of the great river and navigate forward. It was stunningly huge, and fast-moving. And it’s soooo hot. It was so hot, in fact, that while walking back toward Old Town, we are interviewed on camera by a roving reporter for one of the local TV broadcast stations about how tourists are coping with the heat. We make some chatter about being from California, but it’s not this hot there. (We should have kept our opinions to ourselves, for the week after we got home, it WAS this hot here.) We stood outside in the bright sun, the reporter capturing us on camera. As soon as she was through with us, we made our way to Olive et Gourmando, another item on our list. Check the Menu–Montreal to see what we ate, but here’s a picture of their dining room, which was a bit chaotic this very hot day. The fresh salad was just the ticket. We tried to walk the underground, but after two dead ends, we opted for the Metro. The Victoria Station stairs look just like the Metro in Paris. Montreal is closely tied to France, I assume largely because of their language. We were happy to take a break back in our air-conditioned hotel. Continuing on with our quest to eat Montreal’s specialties, we head to St. Viateur Bagel, where the bagels are cooked in a fire-burning oven. Just the thought of visiting a fire-burning oven on such a hot day seems crazy, but we must press on. We shared a bagel, then went to the local park to rest awhile before tackling Poutine. A few people were out, mostly dogs jumping into the large lake at Parc La Fontaine. It was beautiful and we even had an occasional breeze. We first walked past it (how could we have?) then went in the front door. The smell of french fries hit first, then the sight of the cooks slinging potatoes into great vats of oil registered second. We stood there, trying to decide. A few people come in after us, and we tell them to go ahead of us. The waitress looks at us, and Dave, ever quick thinking, asks to see the Menu. Page after page of Poutine are listed. There’s even a Poutine Matty with bacon, green peppers mushrooms and onions, which should make my son Matthew happy, who occasionally goes by this nickname. There’s even a Vegetarian version. We really want to try this Poutine dish. We really do. But we just can’t. Me, after having said Uncle. One reason is that we still have to try the famous Schwartz’s smoked meat sandwich, which is 10 hot blocks away. We pass the Frite Alors! shop (Frites = French Fries, but skinny). And arrive here at Schwartz’s “Charcuterie Hebraique.” Hebrew Deli, if you will. I’d read up about this. We should order the Viande Fumee, with a giant dill pickle. We did, but passed on the fries, and still ending up splitting the thing. I was really glad we hadn’t tried to eat the Poutine too. We were on a deadline to make the Montreal Jazz Festival’s closing night festivity: the Mardi Gras Parade. We walked down a lovely pedestrian street, through a park to get to the Metro station. Our initial impression of Montreal is that it’s just not that accessible, just not that much to really see here. Or that we’ve seen better in other European cities and that what Montreal has is just a faint impression. We knew at the outset that this trip was not the Big Ta-Da location of some of our other trips. And there certainly is a temptation to compare this to places that remain in our memories and in our scrapbooks (like my comment comparing Marche Atwater to Lyon’s incredible street market–really it was unfair). 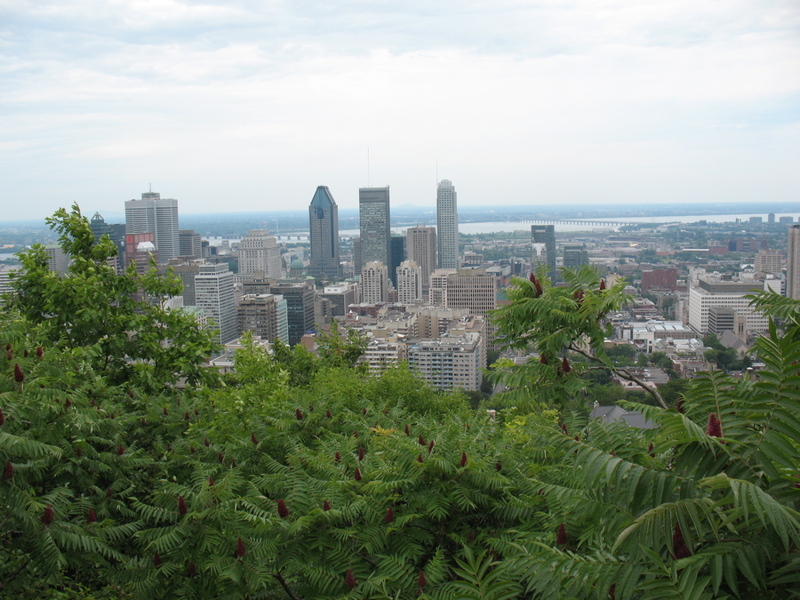 I think the incredible heat wave didn’t help us to “access” the city, for we retreated for several hours each day just to stay out of the heat–and those several hours might have given us a broader view of Montreal. However, it’s when we see a street–and a lovely little neighborhood park like this–that we realize how little we’ve really immersed ourselves in Montreal, that we have just skimmed the surface. But it will have to remain that way, as tomorrow we leave. We line up with billions of other Montreal-ans and tourists, awaiting the beginning of the Mardi Gras parade. It gives us a chance again to notice the juxtaposition of the new and old Montreal, captured by a building’s reflection. A fun little parade, with the slightly rowdy, carefree and less-pulled together approach that evokes Mardi Gras in New Orleans. A pick-up truck pulling a float? Horrors! You’d never see this at the Rose Bowl Parade–the Queen of Parades from our locale. One interesting thing was listening to the woman next to me talk to her friend about when she’d gone to a jazz festival in Switzerland (?) and was listening to some musician famous for long sets. She could leave and catch her train back to the city where she was staying, or stay and listen. She stayed, fell asleep, and woke up at 6:00 a.m just as the artist as finishing his set. The field, she said, was littered with people like her who had zonked out. The group ended, she applauded, then got up to catch the 6:30 a.m. train. The first necklace I got I gave to her, as she was a true jazz lover. But we soon got others, as every pick-up was filled with cardboard boxes from China, full of garish beaded necklaces that we all screamed for and waved our hands to get. I get to listen one last time to some pipers–wonderful. They’re about the only ones in the parade who aren’t wearing necklaces. I catch in silhouette a float bearing a likeness of a trumpeter, and then it ends. We donate our garnered strands of beads to a little girl, and head back to our hotel. Thought I’d show you the doors going into the Metro stations from the street. They pivot on the center which means, now that we’re having a heat wave here, that they can prop them open to get a breeze into the extremely hot and muggy Metro Stations. Just outside the Metro, Dave spots this urban art: snake on a wall. We begin our Frommer’s Walking Tour with the bank, and I thought Dave’s photo (below), capturing the upper balconies in so many different soft colors was lovely. We found four Montreal different walking tours online at Frommer’s, and while we didn’t follow them all, they were helpful to know what to see, what to head towards. We’d also picked up their small Montreal Day by Day book which was invaluable (and also had some of the same walking tours). 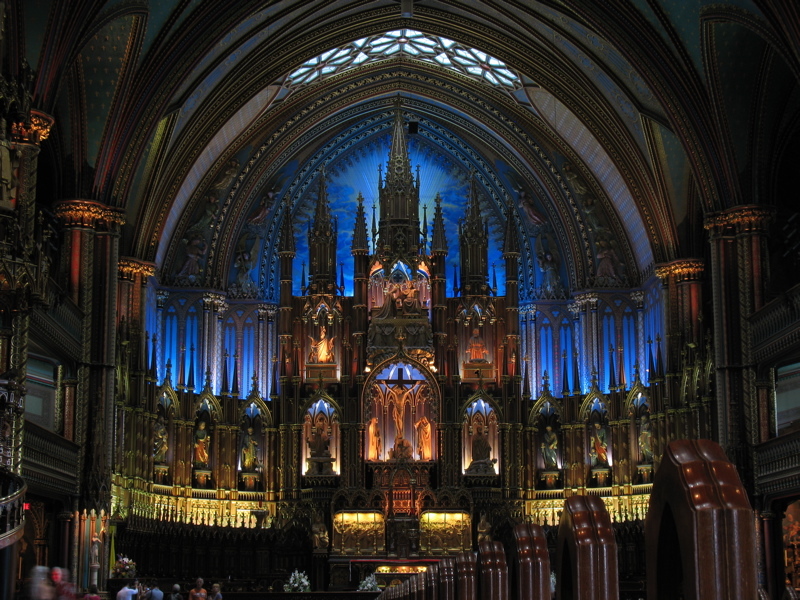 Next stop on our walking tour of Vieux-Montreal (or Old Montreal) was this basilica. Tourist whine: we had to pay to get in. Tourist kudo: the apse (what you’re seeing above) is incredible, and in our pictures (this one’s taken by Dave) we decided it looks a Hollywood set. But it was cool looking. Dave had given me a portable tripod for my camera and we used it to great effect in this dimly lit place. If you pick up a brochure at the beginning, it identifies all these carved wooden figures on the altarpiece; two which are shown in this photo to the left of the crucified Christ are Melchizedek and above him, Moses. The polychrome statues represent St. Peter and St. Paul, as well as the four evangelists: Matthew Luke, Mark and John. Those on the right are Abraham preparing to sacrifice Isaac and above him, Aaron sacrifices a lamb. Mary is being crowned by Jesus. It’s all very ornate, but because they use wood, it’s beautiful. If you are interested in the details, visit their webpage. The entry price includes a visit to the small chapel in the back which is more modern, as it replaced the original which was destroyed by fire in 1978. The bronze sculpture at the front is massive, but I was more entranced by the elegant woodwork. This is one wall, just as I came back from the small chapel. While I usually hate to use my flash, I finally succumbed in order to see all the colors that this basilica is painted. I loved all the different colors. The organ loft that holds a huge organ. Of course, I would have wanted to go up there, but better yet would have been to hear someone playing it. There were a lot of tourists in there! I was tempted to ask her to water me, instead of the flowers. Notice that most of the tourists (us included) are walking (or attempting to walk) in that narrow sliver of shade up against the building. After lunch at the Marche Bonsecours, we dodged back to our hotel after lunch and did not emerge again until nearly 5 p.m., when we finished our walking tour of Old Town, and had an unremarkable dinner (but at least they had a jazz singer and a guitarist to soften the blow of okay food). This is Place Jacques Cartier, with a statue of Lord Nelson on the pillar at the top of the street. (I used to live on a Lord Nelson street when our family lived in Lima, Peru–how’s that for a small world?) This “place” or square is pedestrian only and is rimmed by restaurants and small shops. If hadn’t have been a billion degrees outside, it would have been more inviting. So how did these people training do it? I watched them go down the slope of the Place, switch places, and then run back up again. Anything for a good workout, I suppose. 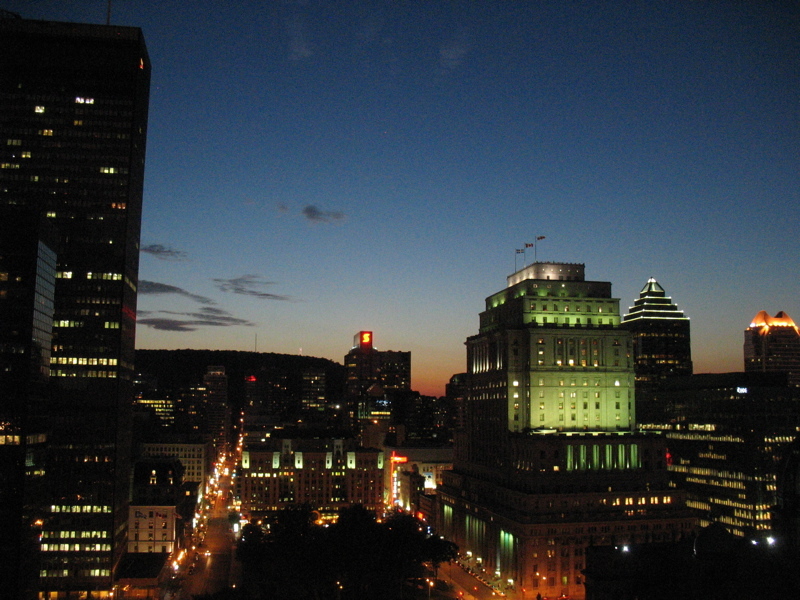 And just beyond the Place, across the street, is this view of Montreal. We headed to the Metro. 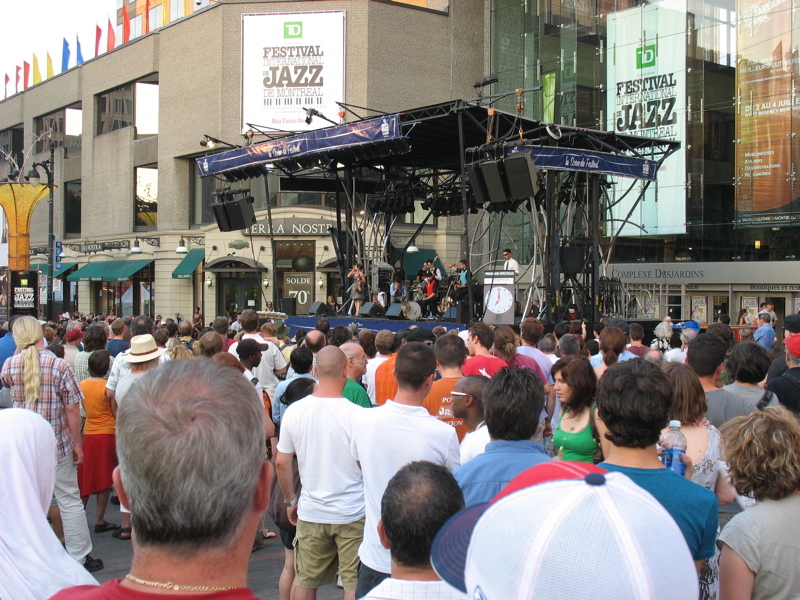 . .
. . .to attend the Montreal Jazz Festival, which was closing this week. We thought we ought to at least catch some of it. More Metro art, while we wait for trains to come out of that dark tunnel. And when we arrived at Place des Arts, more art. I’d done a little research before going, so I knew to look for the art in Montreal’s Metro. The Montreal Jazz Festival wisely had this free venue where lots and lots were gathered to listen to the music, or just to do something different. We listened to “Cow Bop,” a County-Western band from California. I’m trying to catch some passers-by to be-bop to their music. I caught two. A friendly tourist took our photo and is our habit, we reviewed the shot in our camera. 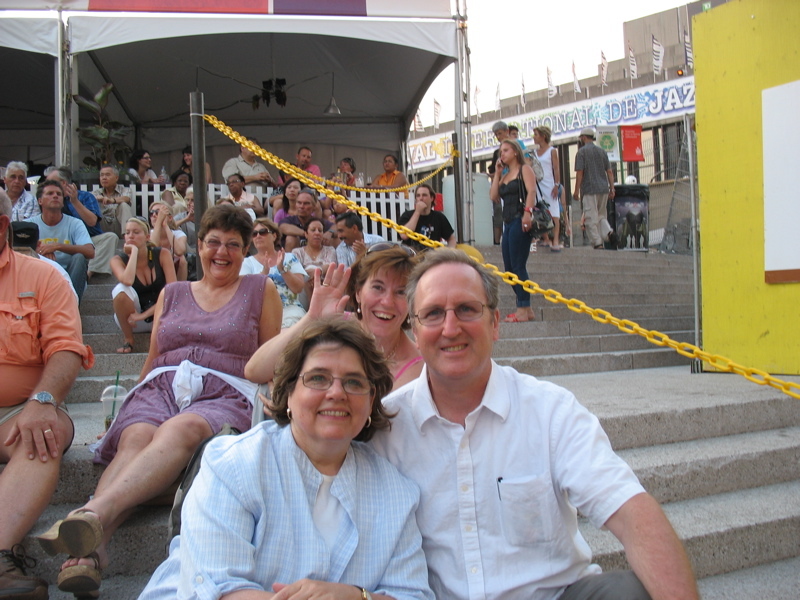 Dave and I both burst out laughing when we saw the lady behind us waving in our photo. I struck up a conversation with her: she’s from Boston, visiting the city, and is a quilter. Like any proud grandmother, I whipped out my phone to show her pictures of. . . my quilts! She did the same and we had a great conversation about quilting. Shortly after this, we left, making our way back through the swamp-like conditions of the Metro to our air-conditioned hotel. As we sat in the Metro, I could swear that the gray tiled wall was slanting in certain directions, but Dave just said it was an optical illusion. He’s right. But I couldn’t stop staring at it. We flew early this morning to Montreal, leaving behind the green Nova Scotia islands. First up: locate hotel. Next up: persuade them to let us check in early (it’s 9:30 a.m.) Miraculously, they did let us check in. Bliss. We took time to get the wireless working for our iPhones, took a break, then went to find lunch at L’Express. As I said to Dave over our amazing little lunch, Montreal is like France–but without an attitude. When I asked a question of the waitress, she didn’t roll her eyes one little bit, but instead switched to English, as the country is bi-lingual. 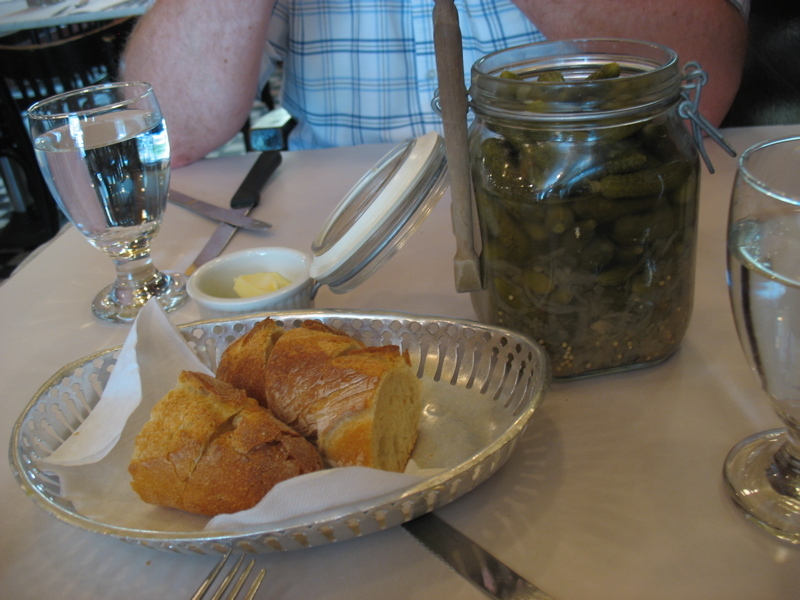 And yes, that is a vat of cornichons, served with Dave’s lunch (I enjoyed some too). L’Express restaurant has no sign out front and is open from mid-morning until after midnight. A popular place. We then took Bus 11 to the top of Park Mont-Royal, where the views were accompanied by a soundtrack of a busload of 50 teenagers from New York City chanting rap rhymes. This park is across our view horizon when we sit in our hotel and look out. The day became increasingly hotter and muggier. Yes, Montreal was at the beginning of heat wave. We took a path from the viewpoint mostly UP to another viewpoint–I somehow thought it was going to be DOWN–and fretted most of the time that we’d miss our bus back downtown. We made it but barely, by running to catch it. 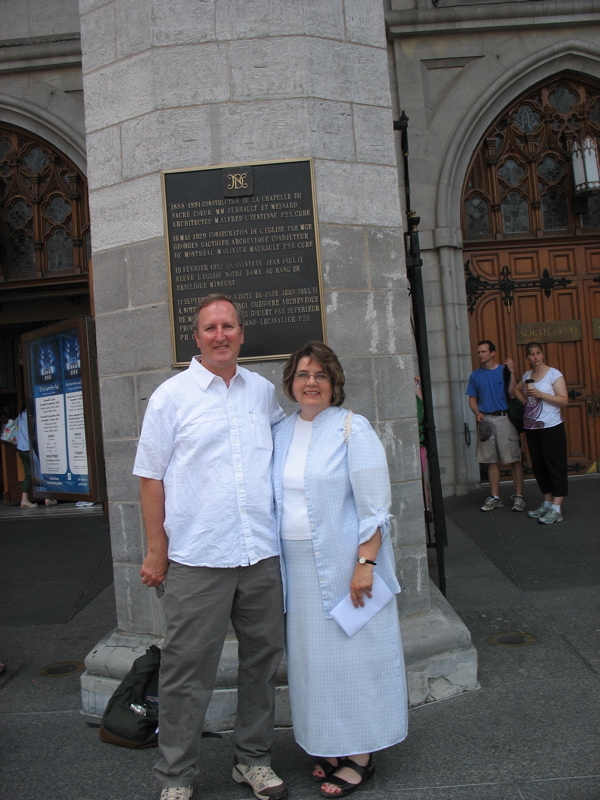 We were headed to Vespers, here, at Montreal’s Anglican church. This was our nod to church this Sabbath day. I could see the light from the stained glass windows come in behind the singers and it was all I could do to not quietly creep up behind them and take the photo. I resisted, and watched the kaleidoscope of colored light paint the wall. After the service, I did get the photo. 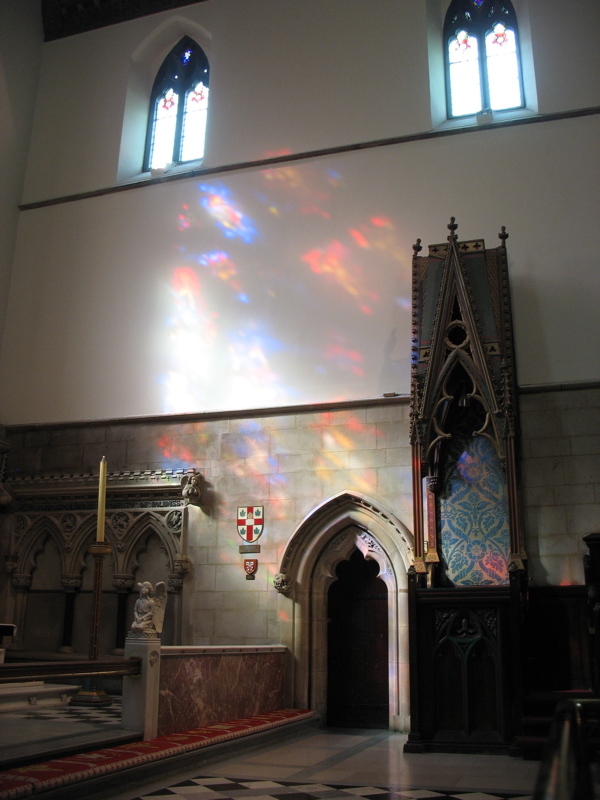 The glass buildings surrounding the old church competed with dualing images. The refracting lights gave an otherworldly effect to the front portico. One soweth, another repeath, are the words in this little stone alcove. Now Dave has been afflicted with Touristus Crankus, and sits out the snapshots I’m taking of these homeless meters. These meters are really quite an ingenious idea, and are placed all around downtown. Instead of doling out your spare change to “l’itineraire,” you put it in these meters. Not only does it solve the dual problem of lingering beggars and our guilt, it also brings in money to help them. We put our spare change in a couple of times, and were able to dodge direct petitions for handouts. We decide to get out of the heat and head to our hotel, but first duck into the church patterned after St. Peter’s at The Vatican in Rome. The name of this is Maria, Queen of the World. It’s right next to Queen Elizabeth hotel, and just up the street from the Marriott, where we’re staying. Although the Marriott (on the right) was designed by a Famous Guy, it has earned the name of The Cheese Grater, because of it’s arched windows. I don’t care what they call it. It was about the most perfect hotel ever, in my estimation. The elevators were swift and quiet, the room had a delicious view, the bed was terrific, they had a variety of pillows to choose from, free wireless, direct connection (via the underground) to the Metro, nice shower, good lighting, lovely bath products. and lots of well-placed mirrors. I could go on and on, but while staying in a bed and breakfast is nice, sometimes staying in a hotel is nice, too. For dinner we went back up to Plateau Mont-Royal area of town where we’d had lunch. We also popped into a chocolate shop, Suite 88, to satisfy my desire for some chocolate. The above is a well-decorated store front on our way back to the Metro. Just to the left of the red and white “S” is Mont Royal, and the tiny white light on the right of the mound is a giant cross. When we came back from dinner, this was the view out of our window. 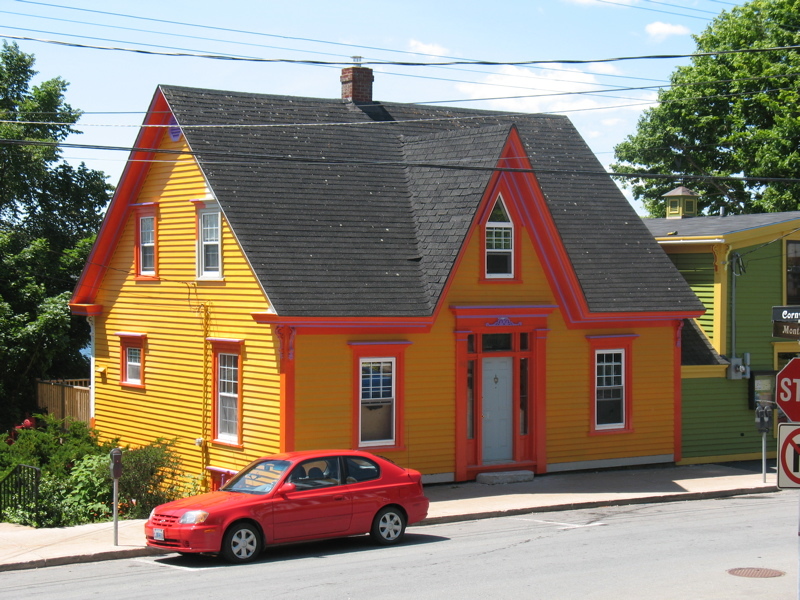 We visited Lunenberg today, a place that has a lot of really old homes as well as others that they’ve painted bright colors (example above). The trim on this is lavender and it has has a blue door, but I think they’re not quite done with the painting yet. We’re two too-tired tourists, so the place didn’t enthrall us quite like it could, given Dave’s aversion to gift shops. There’s quite a few of these here. But, if you had energy, a fresh take on things, the well-kept houses provide a narrative of sorts for a small Canadian fishing village. We took in an art exhibit at a local gallery (there are LOTS of those–another reason to enjoy the place) which detailed the life of one old fisherman, and his life on the sea. 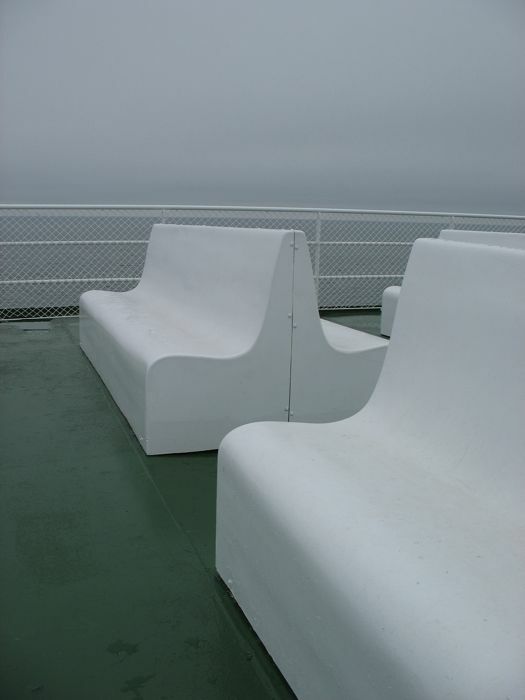 They did without a lot of comforts, both out on the boat and (certainly) at home, and he lost a lot of shipmates and good friends to the vagaries of the weather, tides and storms. Here are some of the sights, in bright sunshine! Another fishing village we saw lots of colorful houses was Burano Italy. There is was said the women painted their houses bright colors to entice the men to return home. I don’t think they’d say the same thing about Canadian men. This is a map of Lunenburg, which is about twenty times larger than Peggy’s Cove, about 50 times larger than Mahone Bay and about a billion times larger than Prospect. But I might be exaggerating a bit on that last one. I like the dots atop this one. This house is on a lot of touristy brochures, I’m sure for its bluey-periwinkle color. Did I mention that Dave has an aversion to gift shops? That’s one of the main activities here. I actually went in one, looked around, decided that a) I couldn’t carry the item home in the suitcase, or b) I didn’t want another thing cluttering up my house at home that I’d eventually have to get rid of. As a result of Dave’s aversion and my lack of enthusiasm, our souvenir shopping was limited to a grand total of $161 dollars for the whole trip. Even Dave was amazed. That’s why you have to wade through so many photographs–that’s about all we brought home. Down on the harborfront, there were a series of brightly painted red clapboard buildings, which I really liked. This bookstore–Elizabeth’s Books–also had the same color treatment. We stopped for lunch into a tiny place that was seemingly run by cheerful teenagers, and had a quick, but delicious lunch. This was not it, but we did like the flowers. After that we walked up to the St. John’s Anglican Church, which had been rebuilt after being partially destroyed by fire. It was a hot muggy day, so we were glad to enter to cool church. The last quirky thing we notice was this curvy doorway over the main door and two side windows. We saw this repeated in several different houses. 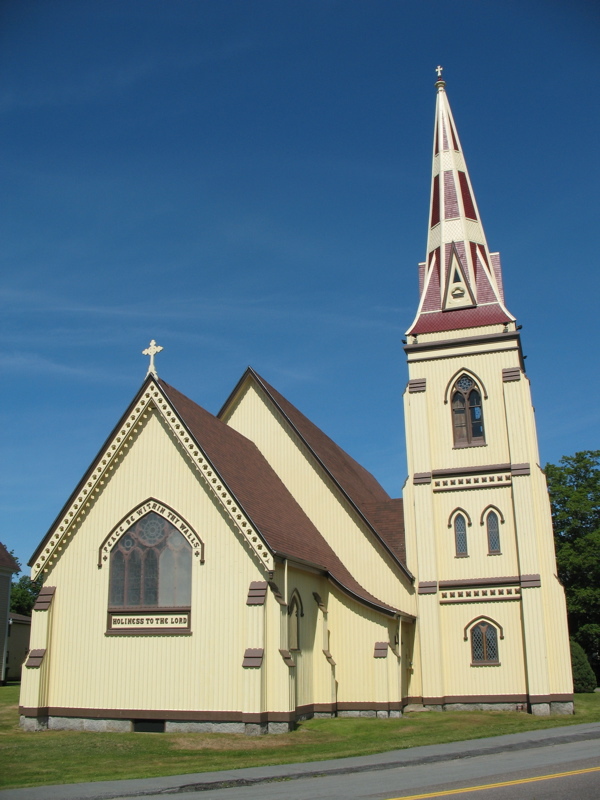 Mahone Bay, the next town, is know for its three (although we counted four) churches. One of them is this striking example, with the phrase “Holiness to the Lord,” written out underneath the main stained-glass window. They also had several gift shops that sold quilts–a delight to see. This is the view of Mahone Bay (est.1754) from across the bay. Nearly all these churches are on the same small street. We’d pretty well exhausted all the things to do in both Lunenburg and Mahone Bay, so we headed back to Halifax to enjoy our last afternoon. First stop, the cemetery where the Titanic victims were buried. We arrived at the same time as another tour bus, the tour guides all dressed in blue kilts (women). Loved this ode to this particular Englishman. 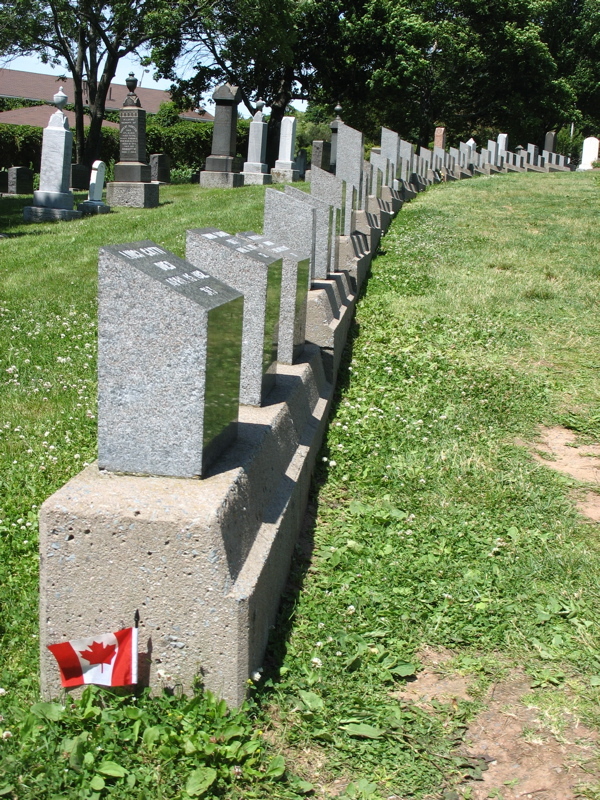 I wanted to see two sets of graves in Halifax: the one from the Titanic (victims who were not taken to their hometowns for burial) and the ones from Halifax’s great explosion in December 1917. This is one row of the former; the latter only had a “group” memorial plaque of the unknown victims, with no individual graves. At the time I didn’t know where the rest were buried–thinking it was probably their own little church cemeteries. However, after arriving home I found out about the Explosion Memorial in a local park. Like any good tourist, I have to say I missed a few sights, but was really chagrined to have missed that one. 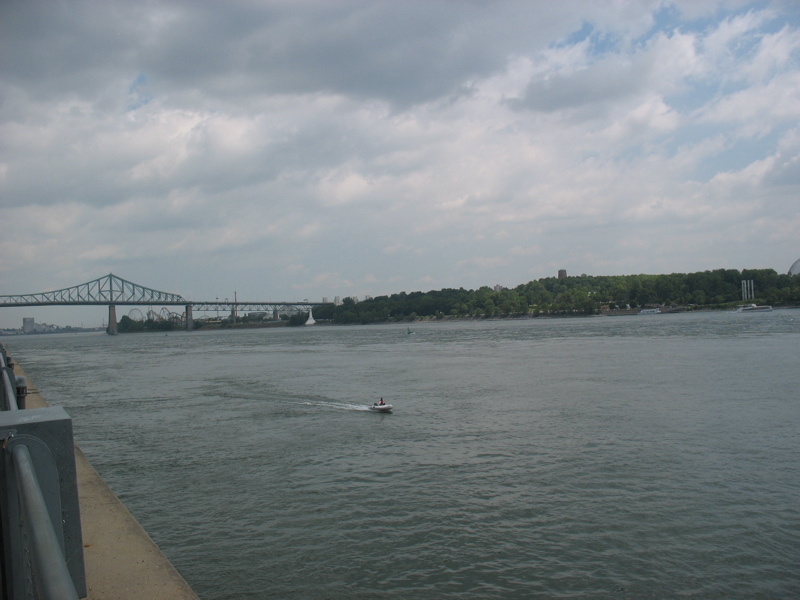 We decided to cross over one of the bridges to the other side of Halifax–an area called Dartmouth. This is a view of the little dressed-up tugboat in front of the Halifax Harbor. Notice the giant cruise ship (white, on left). 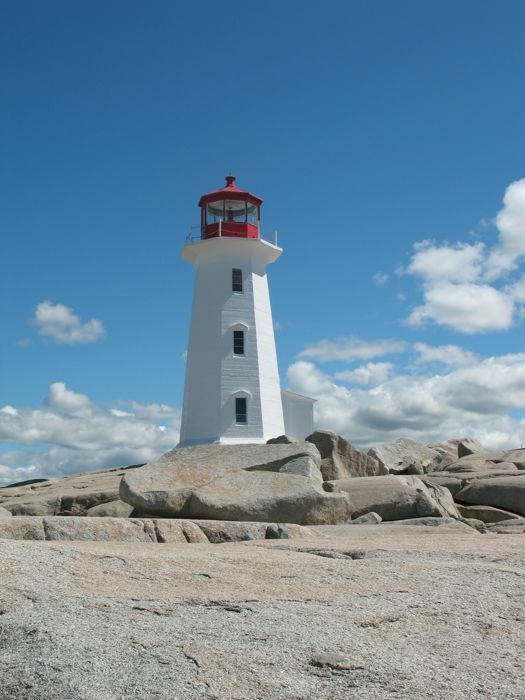 We’re glad we dodged them at Peggy’s Cove today. About all we can say about Dartmouth is that it is an “Oakland” to Halifax’s “San Francisco,” in other words, we hardly got out of our car and zipped back over another bridge back to Halifax. As usual, we’ve skimmed the surface and we know it. I loved the giant flags–hanging up for Canada Day? Or there all the time? It’s too early to go to dinner, so we relax for a while in the Public Gardens, kitty-corner from the Citadel. As soon as we walked in, I could smell the fragrance of lilacs. For some reason (maybe too much for too long) I will admit to a certain amount of Tourist Crabbiness. The fragrance began to help set me on the road to being cheerful again. Maybe it’s because I’d been one too many days without chocolate or been one too many days on the road? Who knows? But being out in Nature set it back right. And we saw three different wedding parties taking photos in the gardens, this Saturday afternoon, distinguishable by the bridesmaids’ outfits. Ah, yes. I’m sure that’s what the bride will always remember about this day. We take a few minutes to sit on a bench: Dave’s reading his book and I write in my travel journal, which I can never seem to keep up with (regretfully). We decide that FID restaurant is probably open now, and head over there. This photo is from the restaurant’s website, and that long pointy thing to the left of the fireplace, up on the back of the checked wall is a fid–a rope-making tool for sailors. After finishing our feast (the first time in Canada we went bonkers over the food), we headed back to our Faux B&B. We wanted to pay with a different credit card that charged less for international charges, but the owner had already gone ahead and charged the one I used to secure the lodging. This left us shaking our heads why he would do this, but then that’s how we felt about a lot of the stay there. We packed and crashed–early start tomorrow.